Beautiful Incentives: #CostPlusWorldMarket #BlackFriday Specials and #Giveaway! #CostPlusWorldMarket #BlackFriday Specials and #Giveaway! Are you a fan of Cost Plus World Market? What about the show, Downton Abbey? If you haven't heard of the store, you really need to check them out! Especially with the Holidays fast approaching. WHY? Because they have the most unique and beautiful home decor, gourmet foods from around the world and so much more! I have bought things from them and i can say with great certainty they are something you want on your Gift list! You HAVE to visit! Are you a fan of the show? If so, when you purchase in-store, if you are among the first 100 customers, you will receive a FREE Abbey Tea Cup in Gift Box set! 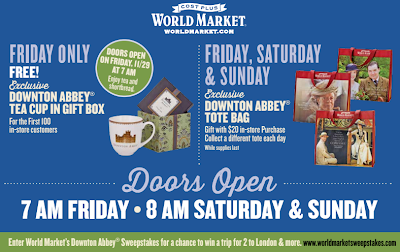 You can also receive a FREE Downton Abbey Tote bag with a $20 in-store purchase! 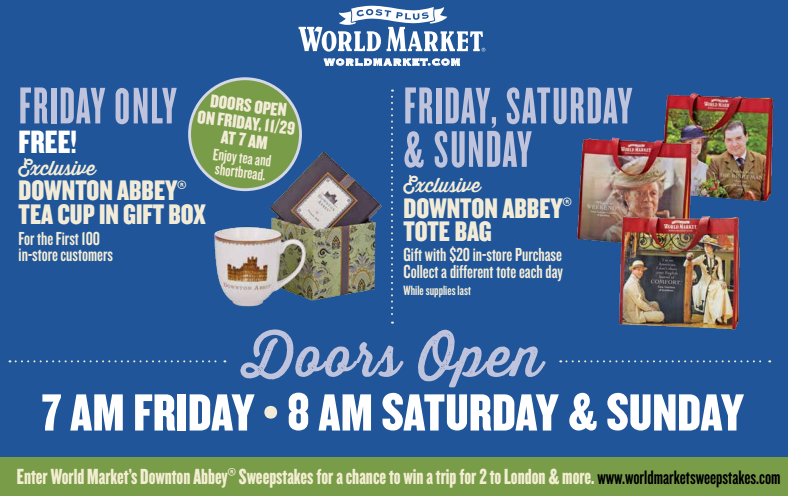 Downton Abbey giveaway items! Friday 11/29 ONLY!